"My aunt gave me this recipe because she knew I loved imitation crab. It is amazing how simple and quick it is and VERY GOOD!" In a medium bowl, mix together eggs, milk, mayonnaise and cornstarch. Mix in the imitation crab and Swiss cheese. Pour into pie shell. Bake in preheated oven until a knife inserted into center of the quiche comes out clean, about 30 to 40 minutes. Easily turn holiday dinner leftovers into a delicious quiche. I made this this morning for our teacher breakfast, and it was gone in 15 minutes!!! I wish I would have made 2. So quick and easy, I will next time. DELICIOUS!!! This was a great imitation crab meat recipie! !...I love imit. 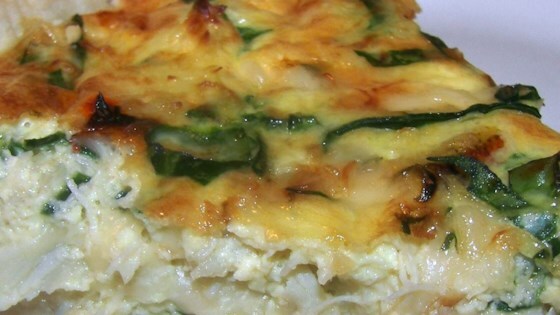 crab meat and with the swiss cheese, this quiche was very delicious and delicatly flavored, even the kids liked it!! !